Our range of LED products complements our ability to create customised LED Lighting Solutions. The solutions we create illuminate businesses and homes across the world. To find out how we can help you with your project please read on. At Fibre Optic FX Ltd, we stock and supply an enormous selection of LED lights and LED based lighting ideas. Many of our products incorporate custom built frames or bespoke manufacturing solutions. Our diverse catalogue of LED lighting products, are suitable for personal home use and business applications. 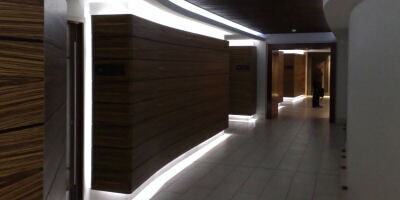 More samples and case studies of our LED Light work can be found here. We offer an extensive catalogue of 12v and 24v LED lights for the kitchen, living room, bathroom and bedroom areas. These include small and large LEDs which are both highly functional and elegantly decorative. Powerful and bright, with the option of dimming with an appropriate driver and power supply unit, our broad choice of LED ceiling lights incorporates LED spot lights, LED downlights and recessed LED ceiling lighting options. LED wall lights are suitable for interior and exterior use. Our indoor wall lights for the home include LED picture lights, LED back lighting products and directional spot lights. Our outdoor LED wall lighting ideas include wall-mounted 24 volt LED security lights, LED garage lighting and LED tape lights, which are available in a full range of colours. Appropriate for use with both indoor and outdoor swimming pools, our LED swimming pool lighting products include submersible LED lights and a wide range of LED perimeter lighting solutions which can be positioned around the edges of your pool. We also stock a selection of fully waterproof, marine LED lights for ponds and water features. These are treated with fungicide and algaecide for low maintenance. Our interior LED wall lights, LED ceiling lighting solutions and recessed LED floor lighting products are all suitable for corridor illumination purposes. Chrome, brushed aluminium and brass LED picture lights can be used to illuminate any picture or photograph. We also stock a range of LED cabinet lighting products including LED tape lights and LED under cabinet lighting for kitchen and bathroom units. Highly practical and superbly elegant! Our outdoor LED lighting systems are bright, powerful and colourful with the added advantage of being cheap to run and effortlessly easy to maintain. Exterior LED lights are also weatherproof and can withstand heavy rain, icy cold temperatures and unexpected flooding. Programmable LED lighting displays, scrolling message boards and large LED screens can all be used to attract attention and draw a crowd when you are advertising your bar, hotel or restaurant, or any other type of business. A cost effective alternative to conventional neon lighting and CFL lights! High powered LED spot lights, bright white LED down lighting lamps and outdoor LED floor lighting solutions offer optimal safety and unrivalled security. As well as functional lighting which offers improved visibility for foot traffic, we also offer decorative solutions for promotional use. Our super bright LED lights include 12v LED spot lights, weatherproof recessed LED lighting for outdoor displays, directional lamps and full colour, RGB and RGBW strip lights which can be used to illuminate any indoor or outdoor installation or feature that you wish to draw attention to. Great for museums, art galleries and product promotion! Ultra-bright and incredibly powerful, our LED flood lighting solutions are surprisingly cost efficient to run. Using a fraction of the electricity that conventional lighting solutions are associated with, our large outdoor LED lights are maintenance free and exceptionally affordable to run. As leading bespoke LED lighting solution manufacturers, we can help realize even the most ambitious projects that our clients have in mind. Please take a look at our LED lighting gallery to see some previous examples of our work and to check out the unique collaborations we have been involved with in the past. We supply fixtures, fittings and lamps for any size, type or design of LED Lighting project. Our clients are usually home consumers or successful companies and business users in search of bespoke LED lighting installations that are designed to wow and impress their target audience. We have created a handy information page telling you all about our LED lighting products and LED lamps. Whether you are in search of a large, custom manufactured LED backlit display for your latest product launch, an LED remote control system, LED house lights for personal use, cheap portable LED lights, or a selection of straightforward replacement LED light bulbs that will fit in your existing light fixtures with no need of modification, such as the latest range of Philips LED bulbs, the team at Fibre Optic FX Ltd are always glad to help and readily available to fulfil your order.